Bookmatching is achieved by adjoining together two slabs, cut right next to each other from the same block. The look that is achieved is a perfect mirror image just like the wings of a butterfly. So, when the two slabs are opened up side by side you get a perfect reflection, as if the slab is propped up next to a mirror. Where would you choose to go for a bookmatched look and in what material? Bookmatching brings the most wonderful symmetry to any room. In bathrooms we often bookmatch whole walls or floor tiles but you can get a similarly enormous impact from two walls in a shower. In kitchens, bookmatching is perfect for achieving a seamless look, especially with wrap around kitchen islands and also with worktops that run into the wall/ up into splashbacks. 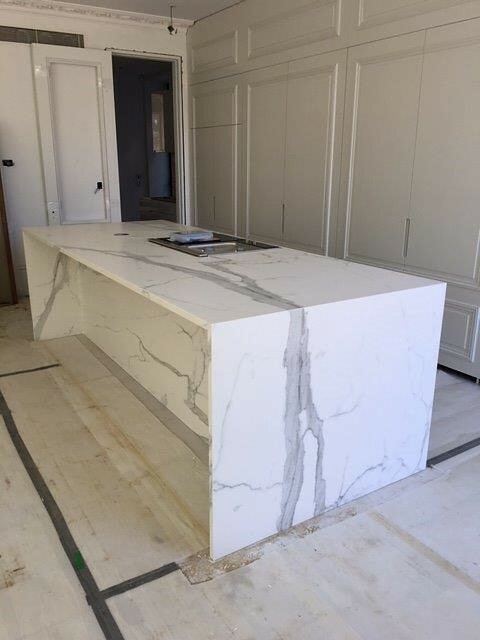 Natural marble is the most commonly bookmatched material, but some engineered quartz brands also produce marble look-a-likes in bookmatched. 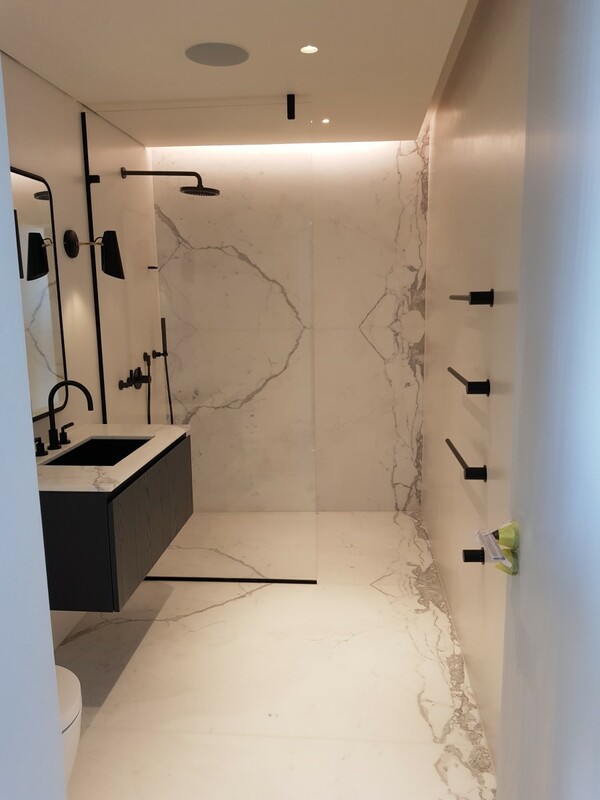 Teltos supply bookmatched material and we frequently bookmatch our popular marble-effect colours, like Teltos Statuario or Borgihini, to superb effect! What are the cost implications of bookmatching? Book matching certainly does add to cost, simply because the wastage element of material is much higher. 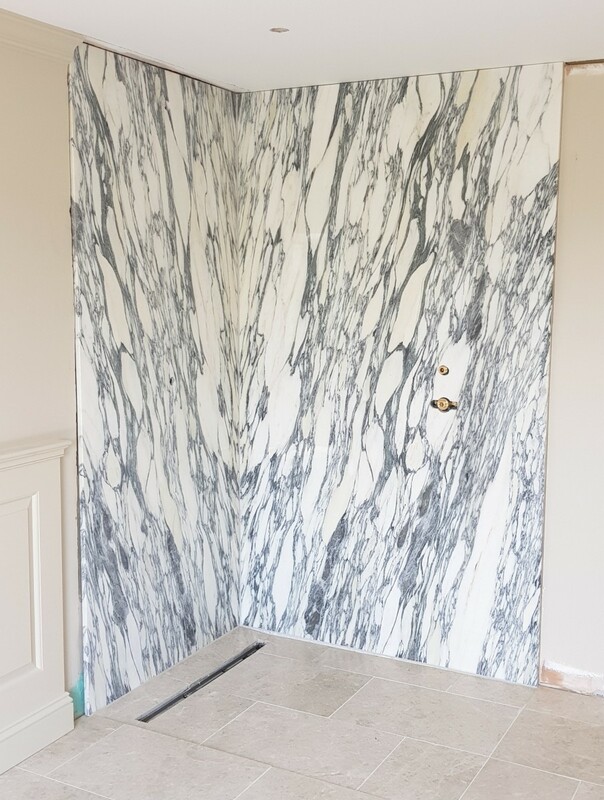 From our perspective, if we’re fitting a bookmatched marble bathroom, if something goes wrong with one slab it may cost us two or even four! The level of intricacy, precision and skill needed to deliver a bookmatched project is enormous. There simply is zero room for error. 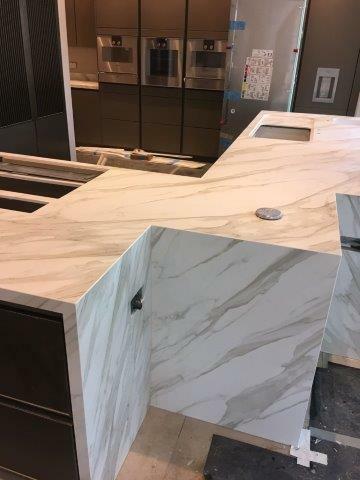 From templating, to sawing, to installation, everything has to be spot on. If you miss by just a little bit, you may as well miss by a mile, because your eye will be drawn straight to it. We have two Masterful Sawyers who are complete perfectionists and the pride they take in their work really must be seen to be believed – it’s truly outstanding. The pressure and the tension in the factory when we’re working on a bookmatched project is great, but the sense of achievement, when a project is delivered is amazing. The level of effort that goes into achieving perfection, time and time again for our customers is enormous. The passion and pride that circulates around our factory is palpable. I truly hope this shines through in the stunning work we deliver. What else is key to consider with a bookmatched project? With any bookmatched project you do need to be careful that the joined material doesn’t create a nasty shape. You certainly don’t want a monster staring back at you! Once you’ve seen a shape you will look for it – you will see it all the time! When we select slabs for a project, we’re incredibly careful to make sure we’re always considering the big picture. Damian, our Head of Contracts, utilises a specialised app to mock-up models to show customers exactly what their installation will look like. 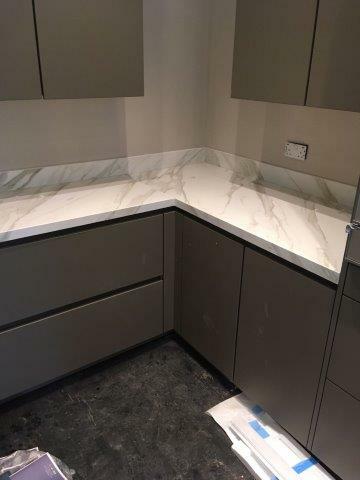 Below are images of a recent incredibly intricate bookmatched project completed for a private client. 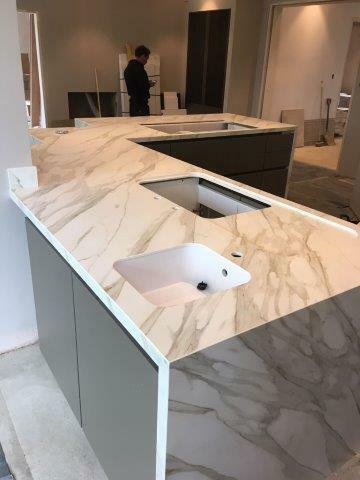 The material is Neolith Calacatta Gold. The initial templating process took three days, which included the drawing up of CAD model with photographs of each individual slab. 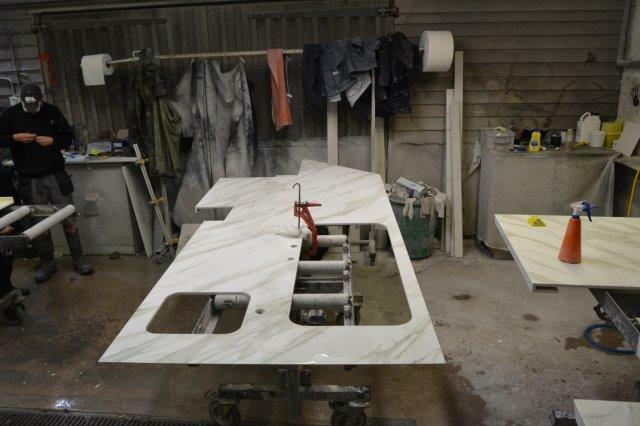 The cutting process took two and a half days of one man’s time and every mitred edge was done by hand! Bookmatching is definitely ‘on-trend’ at the moment in both kitchens and bathrooms. 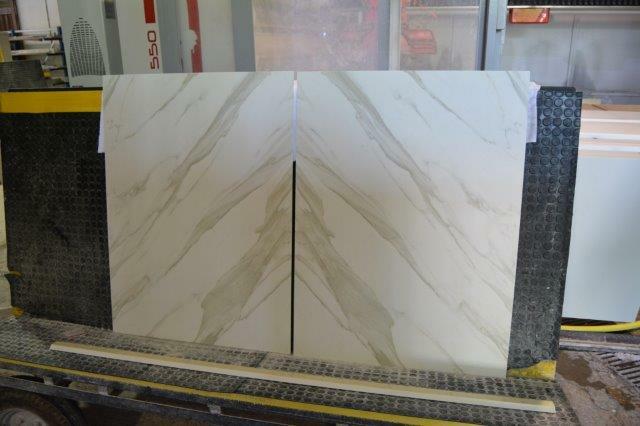 The natural look, with characterful veining, is what customers are after. Our Italian agent is always sourcing incredible bookmatched material for us and we also stock a lot of bookmatched material at our yard. Yes, bookmatching projects can certainly be expensive but they by no means have to be and we certainly don’t want anyone who is after this look to feel at all precluded. If you’re interested in a bookmatched project, please do come speak to our expert team, who will gladly help you explore your options. Bookmatching is beautiful and we’re here to help you achieve bookmatching brilliance within budget!